Units must be set to KN–m. RC material properties : Concrete characteristic compressive strength (f’c, range of values 5000-150000 begin_of_the_skype_highlighting 5000-150000 end_of_the_skype_highlighting kPa), longitudinal reinforcement tensile strength(fy, range of values 100000-1000000 kPa) and tensile strength of links (fys, range of values 100000-1000000 kPa). Rigid diaphragms may be created at floor levels (required for the torsional checks and to check if the structure qualifies for the joint capacity design omission ). The model must be analysed using dynamic spectra analysis, so as to calculate its natural periods and the corresponding diaphragm displacements (required for the torsional checks and to check if the structure qualifies for the joint capacity design omission1). Optional input of accidental eccentricity as a torsional moment at the gravity centre of each floor due to earthquake along the x and y axes (in separate static load cases) or input of the eccentricity in the spectrum of each direction. Static load cases with predefined names EXSTAT and EYSTAT must be created for the x and y directions respectively, so as to calculate the RC walls contribution per floor (to check if the structure qualifies for the joint capacity design omission1). RC walls must be deifned as Piers, comprising of either linear or area elements or a combination of linear and are elements. RC walls design demands that each section is created in the relevant editor of ECtools, since their geometry cannot be directly extracted from ETABS (as is the case for beam and column sections or for Scia Enginner piers). The necessary load cases must be created for the design procedure. They can include from the bare minimum DEAD, LIVE, Earthquake X and Earthquake Y load cases to temperature load cases (with automatic relevant combination generation) and even extra user defined combos. The necessary RC beam and column sections (rectangular, T-, L-, U- or circular sections). 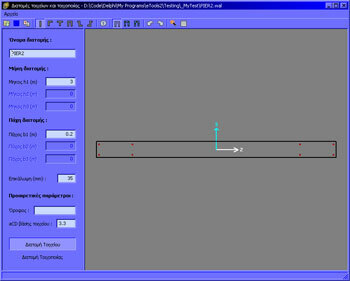 Arbitrary column sections and sections with jackets must be created using ETABS Section Designer. 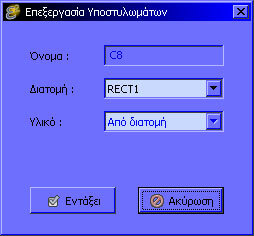 In running the design in ECtools, it is necessary to create an Input file and Output file in the ETABS environment. The Input file is created from File -> Print Tables -> Input. In the following window all the data categories must be selected (from the option Check/Uncheck All) and all the load cases (from the option Select Loads). Also, the Print to File option must be selected and a data file name to be defined (e.g. Input.txt). By clicking OK the data file is saved on the hard drive. 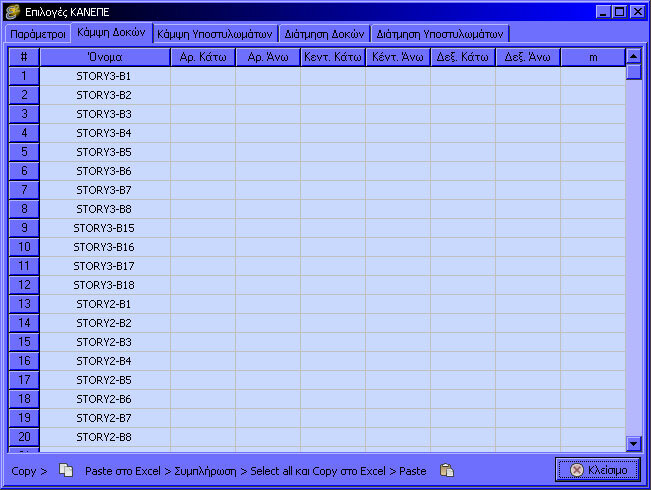 Following a similar procedure, from File -> Print Tables -> Analysis Output an output file is created (e.g. 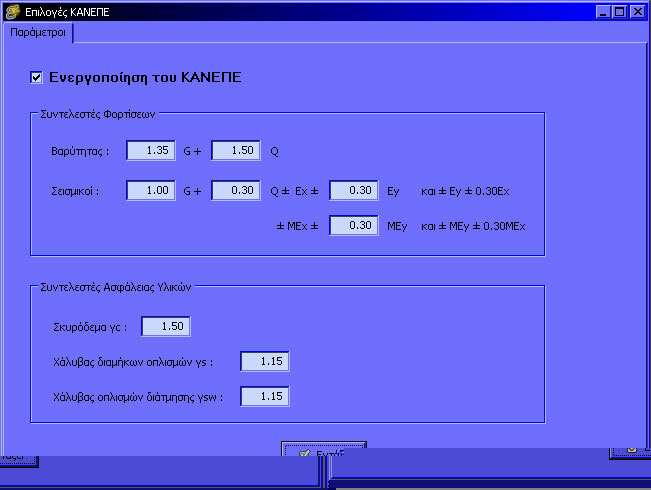 Οutput.txt), presupposing that the analysis has been run. As you will observe in the following sections, the program has designed to accommodate simultaneous processing of hundreds of sections in fast and efficient manner. The basic program operation comprises the design and check of RC and/or masonry structures (EC2, EC8, EC6). 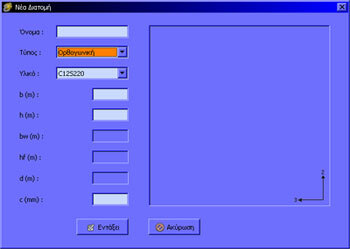 The main design window is displayed by clicking on the first option of the main menu. Firstly, in the above window, the Input and Output files, which were created according to the process in section ‎2.2, need to be entered in the relevant fields. Entering these files is performed by clicking File -> Open Input file and File -> Open Output File or the respective buttons . It is highlighted that the Input and Output files must be located in the same folder with all the necessary RC wall (.wal), masonry wall (.mas) or jacket section (.sd) files. 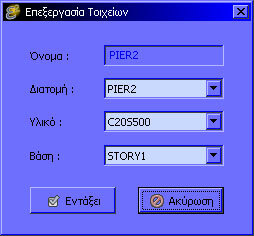 Creating the Input and Output files can be automatically performed by clicking File -> Automatic creation or the button. The user is prompted for the .EDB ETABS model file and the procedure described in section ‎2.2 is automatically executed. Should the ETABS model not be analyzed, then the analysis is also performed in order to enable the creation of the Output file. The Input and Output files are eventually created, which are named <EDB name>_Input.txt and <EDB name>_Output.txt and are input in the relevant fields. The various program options are described before the description of the design procedure. 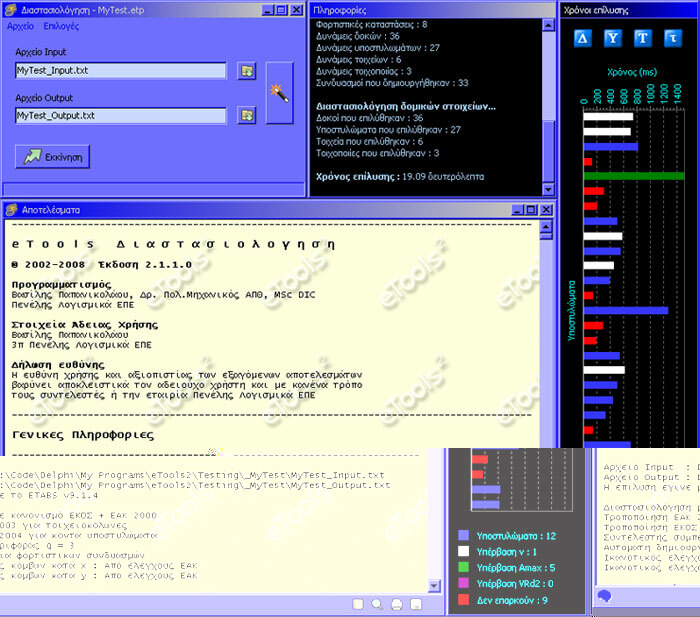 The program has the capability to store all the data of a project in a separate file of the form .etp, which includes all the design options (described in latter sections), the locations of the Input and Output files on the hard drive and additional information that can be entered by the user from File -> Project information. File -> Open project file : Opens a stored project file (.etp extension) from the hard drive. Also, an .etp file can open in ECtools by double-clicking. File -> Create compressed project file (zip) : Creates a compressed .zip file that includes all the files in the project folder. The user is initially prompted for the .etp file of the project and then a .zip file is created having the same name in the project folder. This function is particularly useful for easy exchange of all the project files between different users. Full results file : The user can select if a full results file is to be created after the design is complete, and can define the file name. The full results file includes separate results for all the load combinations and not only for the most honerous ones that appear in the design calculations issue. 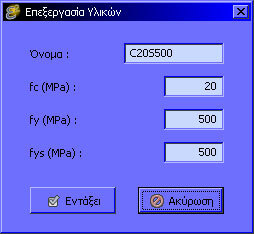 Design calculations issue : The user can choose for the language to be used in the design calculations issue between Greek and English. Exposure conditions : The desirable exposure condition according to EC2 are selected, which corresponds to specific reinforcement cover. There is also the option to select an alterntive reinforcement cover other than the ones listed above, by selecting the relevant option. Standard : The design standard is selected. Options are EC2 (for structures without earthquake resisting requirements) and EC8 (for earthquake resisting structures – masonry included). Coefficient q : The behaviour coefficient, q, is input, which is used for designs according to EC8. Checks : The building checks (design criteria) that are to performed according to EC8 are defined. These include 2nd order effects, joint widths, fill materials, torsional susceptibility and omission of joint capacity design checks. See section ‎3.3 for additional information. Load combinations : The user can choose whether the necessary design load combinations are to be created automatically by ECtools, based on the load cases that have been defined in the ETABS model. Also, the ψ2 coefficient can be defined and whether the eccentricity load cases are to be included in the above-mentioned combinations. Joint capacity design check along the x and y axes : The user can choose whether the joint capacity checks are performed during the structural design. Masonry : The masonry material factor (γm) and the ratio between the compressive and tensile capacity (f¬c / ft) of masonry is entered. Common RC wall base : By definition, each RC wall base is assumed as the founding level of the corresponding Pier that has been defined in the ETABS model (the node with the lesser vertical co-ordinate z). Should the user wish to define a common founding level for all the RC walls in the model, the floor name that is to be defined as the common founding level is entered in the field. The common RC wall founding level can be altered latter during the design run (described in more detail in section ‎2.5.7). For checking an existing structure according to EC2, the option Activate strengthening must be selected and the load and material safety factors to be input in the relevant fields. These factors will replace the default EC2 factors. During the design run the user is prompted for the existing element reinforcements that are entered in table format, so as to perform the individual structural element capacity checks. 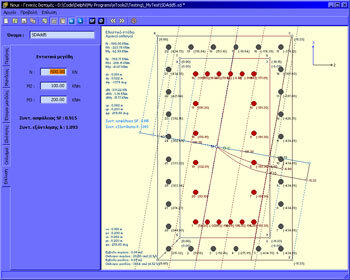 The user can set limits to the bar sizes to be used as bending reinforcement in beams, columns and RC walls and which will be proposed in the design calculations issue. Having entered the Input and Output files in the relevant fields and once the design parameters are set according to the previous sections of this manual (it is recommended at this point to save the project file), the design can be run be clicking on the Run button. The design begins by reading the Input file, whilst simultaneously information regarding the number of materials, sections, structural elements, etc. contained in that file, are displayed in the adjacent window. button : Adds a new material in the table to be assigned to sections. Material properties are entered in the figure shown on the right. For masonry materials, the fvko and flim properties are entered initially at the fy and fys fields respectively, enabling the program to automatically recognise these as masonry materials. button or double click : Edits the selected material properties. It is also possible to edit multiple materials from the table either by clicking the particular button or by right-clicking on the multiple selection. For multiple material editing, all the selected materials should be of the same type, i.e. all concrete or all masonry. button : Adds a new section in the table. Section properties are entered in the window shown on the right. Section type can be rectangular, T-, L-, U- or circular section. Depending on the section type, the relevant data input fields are activated and the section outline is drawn for checking purposes. button or double click: Edits the selected section geometry. It is also possible to edit multiple sections from the table either by clicking the particular button or by right-clicking on the multiple selection. For multiple sections editing, all the selected sections should be of the same type. If the selected section is an RC wall or masonry wall section, then it is opened in the corresponding editor, as described in section ‎2.3. button : Opens the selected section fro editing in Nous (see section ‎2.4). If the section is modified (e.g. by adding a jacket), then it is saved on the hard drive as a .sd file and is entered in the table as a jacketed section by clicking the update button (described latter on). Also, jacketed sections can be edited in Nous by double-clicking. Beams / Columns / RC Walls / Masonry Walls : Displays the structural elements names and characteristics contained in the model. Editing of structural elements is performed by clicking on the button or by double-clicking for a single selection or by right-clicking for multiple selection. 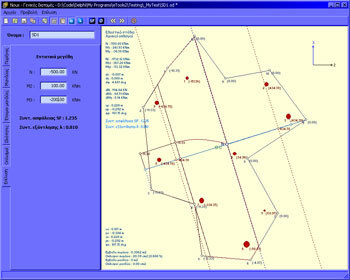 For beams and columns, only the section names can be modified. The section material will be that of the newly applied section. For RC walls the section, material (choice of concrete materials only) and base (founding level) name that is to be used in design can be modified. Initially, the founding level of every RC wall is assumed to be the respective Pier base that has been defined in the ETABS model or the common founding level defined in the design options (see section ‎2.5.4). For masonry elements, the section and material name (choice of masonry materials only) can be edited. button : Updates the jacketed sections in the table from the files contained in the folder where the Input and Output files are stored. Updating is necessary before the design is run, if any additional jacketed sections are created in Nous. button : Replaces existing sections with jacketed sections (strengthened sections) located in the same folder where the Input and Output files are stored. These strengthened sections are highlighted in green (see figure below) in the column, RC and masonry wall tables. The strengthened section creation process is described in detail in section ‎2.5.10. button : Updates the ETABS data file (file with a .Ε2Κ or .$ET extension) to all the modifications that have been performed in the data editing tables window. This new file can be loaded in the ETABS environment from the menu File -> Import -> ETABS .E2K Text File. It is noted that all the jacketed sections created in Nous, are input as ETABS Section Designer sections. Also, all the changes to the correlations between sections and frame elements that have been performed in the data editing window are incorporated in the new data file. Load case correlation : If the automated creation of loading combinations has been selected in the design options (see section ‎2.5.4) the user is asked to correlate the load cases created in ETABS with the G, Q, Ex, Εy, MEx and MΕy load cases (the last two are asked for only if eccentricity load cases have been selected). Define additional earthquake load combinations: For designs according to EC2 + EC8 and for the load cases (and combinations) created in ETABS (except those already correlated in the previous window) the user is prompted for whether these are to be treated as earthquake combinations when designing against EC8. Clicking on the square box by the load case or combination name selects that case or combination as an earthquake one. Depending on the number of the structural elements, the load combinations and the speed of the computer used, the design process can be completed in a few seconds to a few minutes. Aggregate data of the design process and a bar-chart indicating the solution time for each element (in milliseconds – ms) are displayed in the information window during the design run. 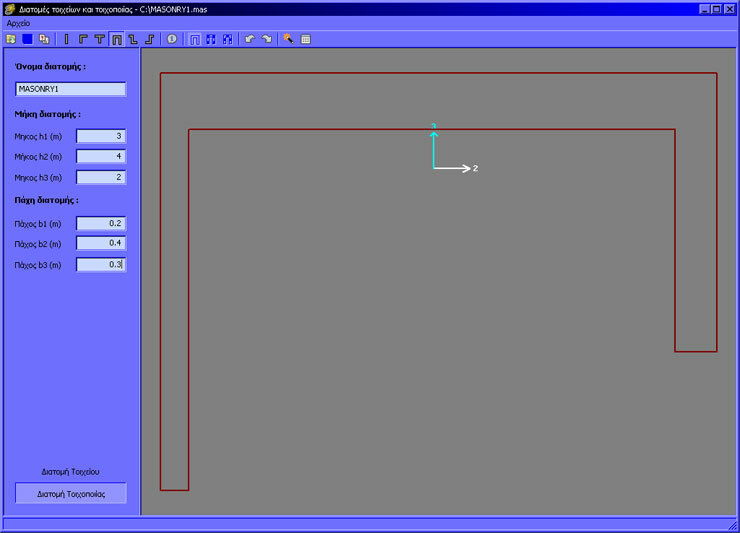 The design calculations issue window is displayed once the design process is complete. buttons : Displays the beam/column/wall.masonry data. Elements that are adequate in the cross-section capacity design checks (safety factor larger than unity). Columns where the maximum ratio (v) of applied axial force to axial capacity as defined in Eurocodes has been exceeded. Elements where the concrete core shear capacity (VRd2) has been exceeded in design. Elements that are inadequate in the cross-section capacity design checks (safety factor smaller than unity). In the cases mentioned above, if the section is a jacketed one (.sd extension) or a masonry wall, then an actual design is not performed but merely a cross-section adequacy check is carried out. Consequently, the only possible states in the bar-chart are (adequate) or (inadequate). 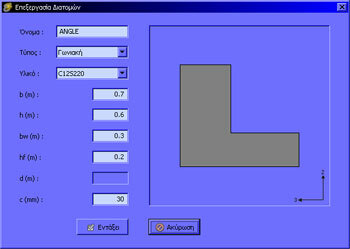 Left click -> Displays the selected element in the design calculations issue. Double left click -> Opens the selected element in Nous. This action is useful for creating strengthened sections, as described in the relevan section.